The trails, in all likelihood, started as game trails to and from springs. A hungry pack of wolves, or a singular scrawny coyote may have put them together, defining a network between springs. Later, Native Americans may have further developed these foot-trail systems for migration and trade. This type of traffic may have went on for hundreds and hundreds, if not thousands of years. 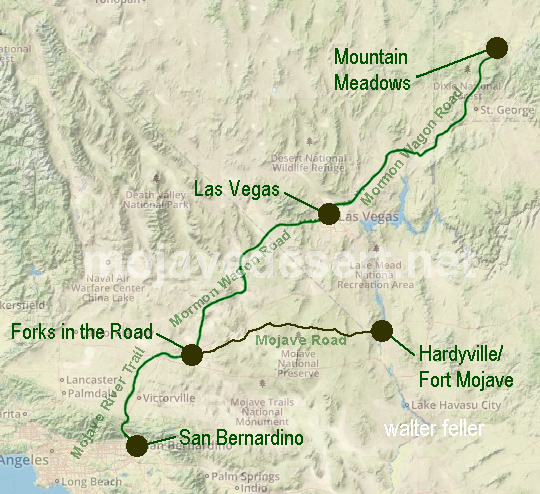 Explorers came and used these trails, and soon they were widened by use to accommodate mule and horse traffic. Alternate routes were developed increasing the probablility of water being available at one spring while another may have been dry. Possibly, carretas passed by, widening the way a little more for the wagons driven by pioneers. Then these worn roads were recorded and outposts to protect travelers were built along their ways. Alignments were adjusted and the roads widened again for automobiles. And after not much time, decades rather than centuries, the roads were widened and paved, then widened, and paved again. These myriads of trails, braided and complex, used and much traveled, became redirected and developed into our transportation corridors of today. These highways, from the time before people, became our historic roads of today. 1829-30 to 1848 -- New Mexican caravans to Los Angeles used the trail for trading horses and thieving. Explorer John C. Fremont met six Mohaves here in 1844 at elevation 2250' and named the river "MOHAHVE". 1848 -- Following close to the Spanish Trail, Henry Boyle and Captain Daniel C. Davis of the Mormon Battalion pioneered the first wagon road to Utah in 1848. Jefferson Hunt and the 49ers took the road back to the California Gold Rush. Freighters, mail carriers, Mormons, and miners passed here. Mohave Indians from the Colorado River used this ancient trade route to the sea and guided Father Francisco Garces to Mission San Gabriel in 1776, the first white man to cross the desert. 1826-1840 -- Trapper Jedediah Smith twice traveled this trail opening the route for American trappers and explorers. Lt. Edward Beale opened the 35th parallel route with camels in 1857-58. Soldiers from Camp Cady and Fort Mojave used this as the Government Road to Prescott Arizona. This road continued to the early 1900s, being designated the National Old Trails in 1907, and redesignated Route 66 in 1927. 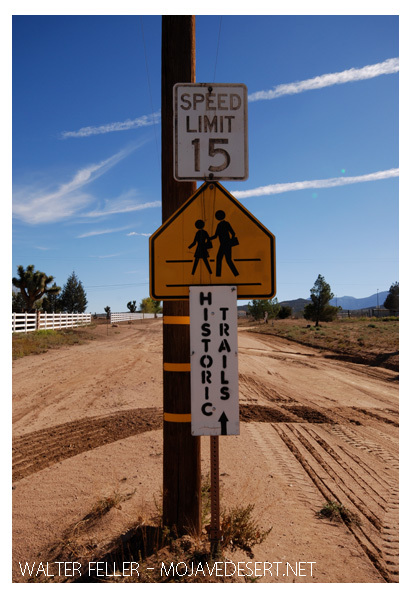 Aaron Lane supervised building a road to Panamint Valley which began near the Cottonwoods. 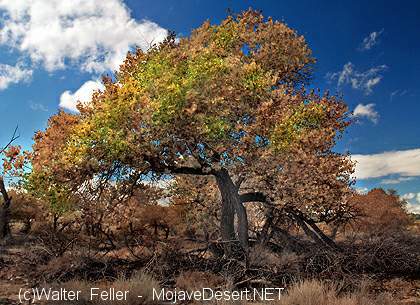 Between what is now known as Barstow and Helendale cottonwood trees grew along the Mojave River. Water was available in steady supply, and in such a sparse environment, the abundant shade made this a favorite camping spot for Indians, and later pioneers weary from their journey across the desert. 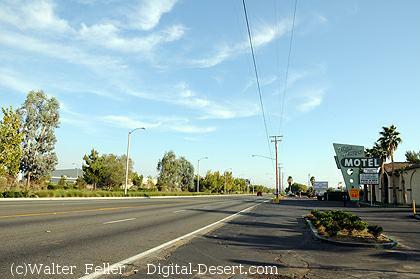 This place became known as, "The Cottonwoods". Occasionally, historic trails are easy to find!